Another "You know you are cheap when . 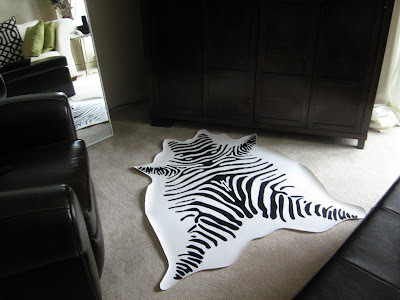 . . " You know you are cheap when you could buy a faux zebra hide rug on clearance at Target for $50 but instead you make your own for 50 cents.I made my rug using white vinyl fabric that I already had on hand and a 50 cent permanent marker. 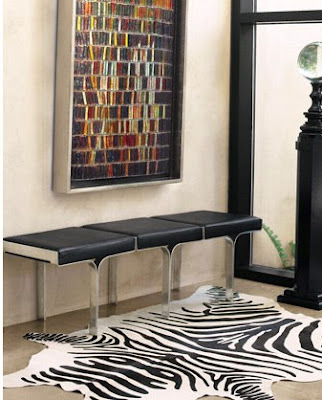 A small rug like mine (3 x5) will require about 1 yard of fabric, and a larger one (5 x7) will require about two yards. Microsuede and fabric paint or a fabric marker would probably give a more "hide" like effect, but the vinyl will wipe clean with a damp rag (and it was free). 1. 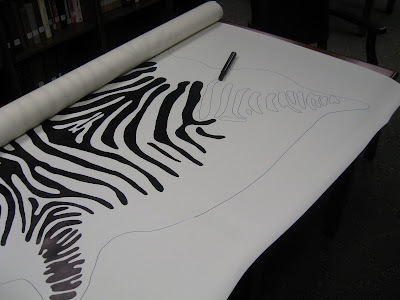 Find an image of a zebra hide and project it onto your fabric. 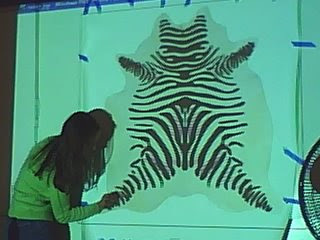 Trace the outline of the hide and the stripes using a washable pen or marker. 2. Color in the stripes using a permanent marker or fabric paint. Allow the marker to dry completely before cutting the fabric. 3. You're done. If the edges roll up a bit, try rolling the rug the other direction and letting it sit overnight. For the record, I recommend fabric paint. Over time the marker did smear a bit. I like your wall art in the picture too. Did you make that? Is it a type of glass wall art? Sorry, that's not mine. The top pic is from Horchow. This is awesome! Now I'm trying to think how to restyle one of my rooms just for this idea. I'm thinking my den and fireplace need a makeover. LOVE this!!! You are brilliant!